All beach destinations, when to go? You know your vacation dates, where to go in the sun? Choose where and when to sunbathe on paradisiac beaches ? What is a cyclone, a hurricane or a typhoon? How can we not end up in a cyclone? At the very best time! The island of St Martin / St Maarten enjoys a tropical climate all year round, with a rainy season from July to September. In September, most hotels are closed, the weather is so bad at this time! the temperature of the sea fluctuates between 27 and 82°F. When to go? The hottest month for the beach, lazing around and swimming is September. Warning, September is a month with cyclonic risks, heavy showers may occur, otherwise other periods are possible. The coolest month is January, if you can not stand the heat too much. The driest month of the year is April, if you do not like the rain at all. 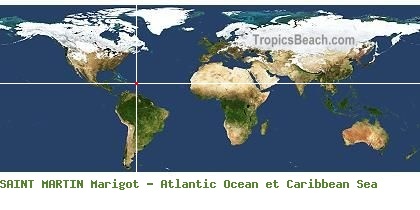 Click on Marigot to display its climate. Perfect conditions to enjoy the beach. Favorable conditions for enjoying the beach. Cloudy with sunny spells and thunderstorms. Very strong tropical or monsoon rains. Months at risk of cyclones with alerts level 1 to 5. 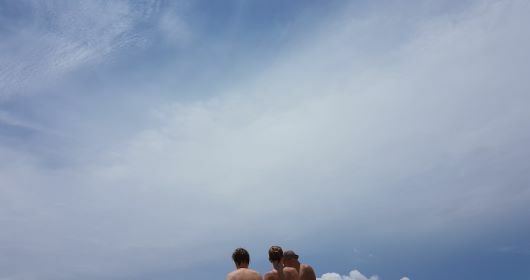 Nice swimming at more than 26°C / 79°F. Everything is perfect for traveling. The sun at its zenith, that means well perpendicular to the surface of the Earth, sending 100% of radiation and heat. Marigot receives in winter (january), 74% of sun power and 99% during summer time (july). 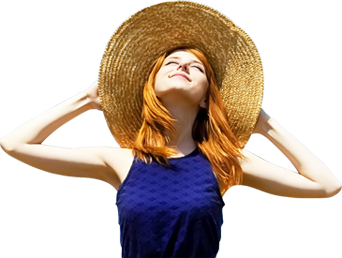 The average temperature and sunshine deviations between summer and winter are 25%. This small gap means that the temperature at sea does not really vary and that the sea remains warm enough in summer and winter. The air is also hot all year round without great thermal amplitude. Marigot showing the annual performance of Marigot for bathing and lazing around on the beaches. On the left, the averages observed every month of April on the Saint Martin beaches. 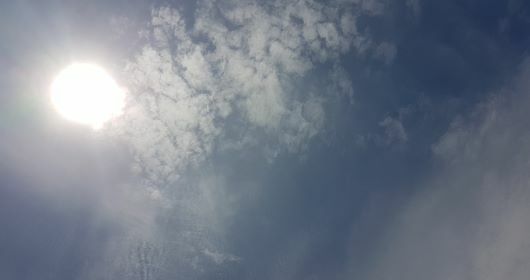 The trends for next month are, the same daytime average temperatures, a bathing water in Atlantic Ocean et Caribbean Sea which takes a few degrees, more abundant rains with warmer nights. What is the period of mosquitoes virulence over the year? Presence of mosquitoes 3/10 at Marigot. Here are the current 5-day forecasts for Marigot / Marigot. Temperatures are spaced 3 hours apart for each day. 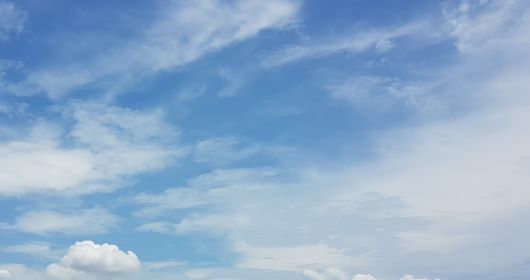 The summary of the state of the sky gives the trend of the week. The sea temperature at is a monthly average. In lagoons or seashores where the bathing water is shallow, you can add some degrees. Weather uncertainties 2019 to go to Marigot ? In the tropics, these « storm » or « rain » pictograms indicate that tropical showers or stormy weather are possible. 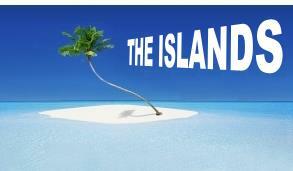 It is difficult to predict the exact local weather in the tropics. This is especially true by the sea and the beach. Consider that more than 180 mm of rain per month is the limit to enjoy the beach on vacation. So check this data provided for each month on the preferred destinations of this site. When traveling in the tropics as a seaside, rain is not welcome. If you see this indicator, with possible storms, that does not mean that it will rain all day long. When we observe the local rainfall, it is either really zero or very weak. Meteorologists prefer to be pessimistic. 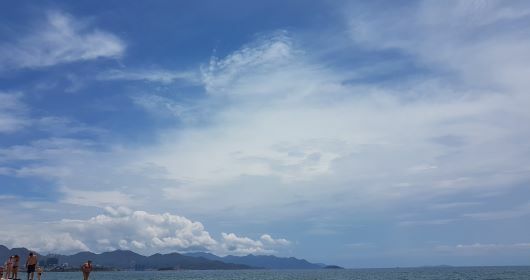 So observe below, the skies photographed during a week announced stormy in Asia. It did not rain once. 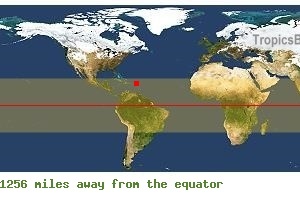 I invite you to integrate this parameter before going to Marigot for a good trip to the sun! Choose the best moment to make your tropical trips a success, avoid rains and hurricanes.